Since its creation in 1860, TAG Heuer has been closely associated with world of professional racing, thus making it the world’s premium sports watch brand. It remains faithful to the traditional values and savoir-faire it shares with professional motor sports: advanced design and materials, high performance, ultimate precision, unsurpassed reliability and a total commitment to innovation. Its founder, Edouard Heuer was an early automobile enthusiast and an avid fan of horse racing. The pioneering Swiss watchmaker, who had a futuristic vision, was thus easily identified the need of the fastest, most accurate, and most complicated timepieces to fulfill the demand of emerging motor racing world.Today, 150 years after Edouard Heuer’s first creation, TAG Heuer remains, at the avant-garde of innovation, the undisputed Master of Speed. Nowhere has that mastery been better tested than in the fast-paced, constantly evolving world of professional motor racing. Through its partners and timekeeping responsibilities, TAG Heuer is a key player in Formula One, Indy 500, Le Mans 24 Hours, the Monaco Grand Prix, and the World Rally Championship. It was the first watch brand to develop dashboard chronographs for sports cars, partner with racing drivers, sponsor an F1 team, and master chronometric time to 1/10th, 1/100th, 1/1,000th and 1/10,000th of a second. But the brand’s link to racing is not just technological. More than anything, TAG Heuer’s commitment to racing is human and personal. Every great hero of motor racing, from Juan Manuel Fangio to Ayrton Senna to Vodafone McLaren Mercedes Champions Lewis Hamilton and Jenson Button in F1, the Audi Team in Endurance, and new star Sébastien Ogier in the World Rally Championship — has been part of the TAG Heuer legend. These driving Ambassadors do more than just endorse the products: they road test them at lightning speeds on the fastest circuits in racing. The result of this intense R&D is a feedback chain unique in the industry. Working closely with TAG Heuer designers, engineers and craftsmen, TAG Heuer’s driving ambassadors provide invaluable insights, which, each year, are turned into new functions and details, and new levels of performance and precision. In 1963 Jack W. Heuer, the son of Charles-Edouard Heuer, started work on a new chronograph specifically designed for drivers and motor-racing enthusiasts. A life-long fan of the sport himself, he knew what it was needed: a wide-open, easy-to-read dial and a shock-resistant and waterproof case tough enough for road wear. The following year he launched the result, a mechanical, manual-wound chronograph called the Carrera. For the name, he reached back to a racing legend from the 1950s, the Carrera Pan Americana, a five-day, 3,300 kilometers (2,100 mile) race across Mexico. The most prestigious — and dangerous — endurance race of its day, the Carerra, which in Spanish mean “competition of the highest order” remains synonymous with excitement, danger, adventure, and heroism. It was the perfect name for Jack’s most ambitious creation to date. The elegant simplicity, purity and sobriety of the optimized dial design made the Carrera a huge success and launched a golden era of creativity and innovation for the Heuer brand. Among their first wearers were every Ferrari Scuderia driver — legends like Carlos Reutemann, Clay Regazzoni, Jacky Ickx, Niki Lauda, Mario Andretti, Gilles Villeneuve and Jody Scheckter. Other 70s greats also wore the watch, including Jo Siffert, Ronnie Peterson, Emerson Fittipaldi, Denis Hulme and John Surtees. Jack W. Heuer’s all-time favorite watch, the extremely rare Carrera 18 Karat Gold, dates from this era. This year, once again challenging existing rules and conventions, TAG Heuer again surprises with the Carrera Heritage Collection, a watch and a chronograph with classic looks, yet deeply rooted in the Carrera legacy. The Carrera Heritage Collection reinterprets the most iconic timepiece of motor racing through the prism of 150 years of horological tradition. 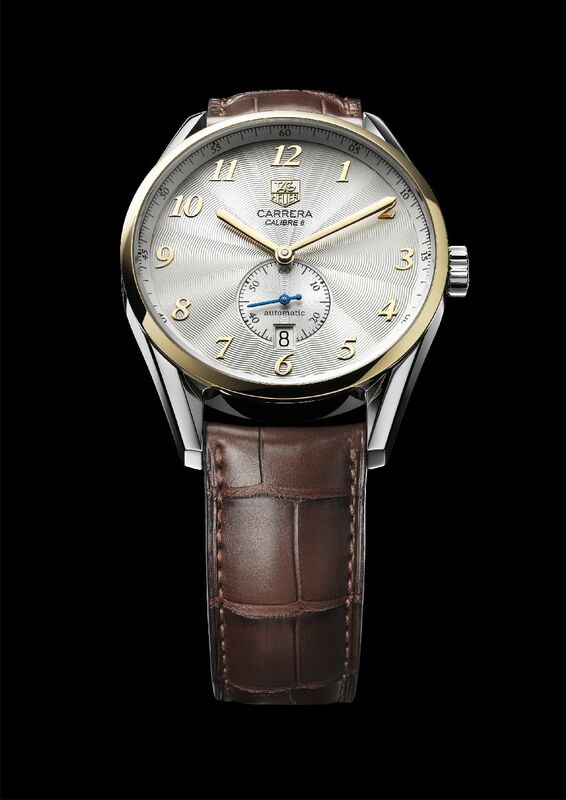 It is not retro but vintage: the classic codes of a golden age of watchmaking are respected and lovingly reinterpreted. The case is polished to a glowing luster, as is the monochrome TAG Heuer logo. On some versions, the hands are a deep and burnished blue. Exquisite “flinqué” engraving texture adorns the dial; for the flange and counters, vintage minuterie. Even the hand shape is historically accurate. The polished and raised Arabic numerals come from an earlier source in the TAG Heuer library: a Heuer watch from 1945. The pushbutton, digits, crown and index designs are also from this earlier “muse”. The Carrera Heritage Collection is available in a 39mm watch edition equipped with an automatic Calibre 6 movement with an azurage embossed small second counter and the date at 6 o’clock. 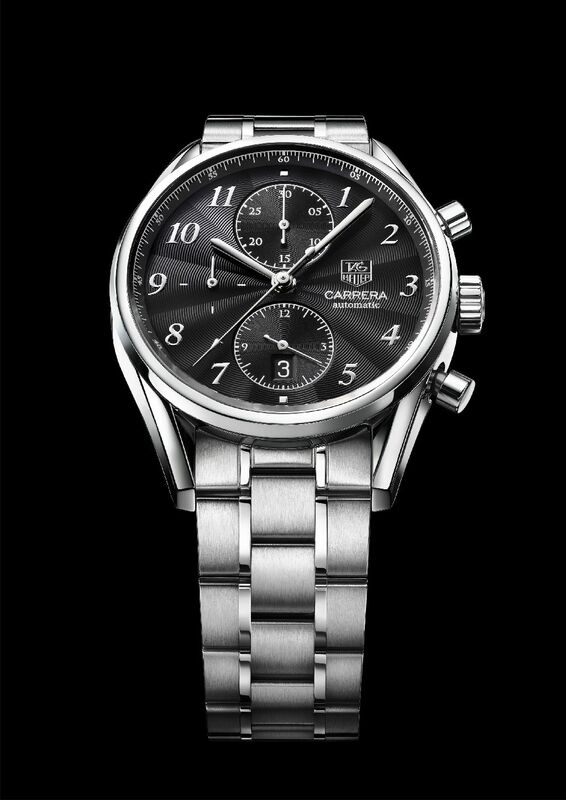 The 41mm automatic chronograph version with the Calibre 16 movement inside and three azurage-embossed sub-counters on the dial. Several options are offered — steel, steel and gold, and steel and rose gold, all with crystal sapphire case back showing the cogs and wheels of the movement inside. Straps are in high-grade alligator with steel folding clasp with safety push buttons; bracelets are 5-row alternate fine-brushed and polished steel. Water resistance is to 100 meters. A standout watch version in massive rose gold is elegantly strapped with a rose gold pin buckle. • Protruded & polished monochrome TAG Heuer logo.